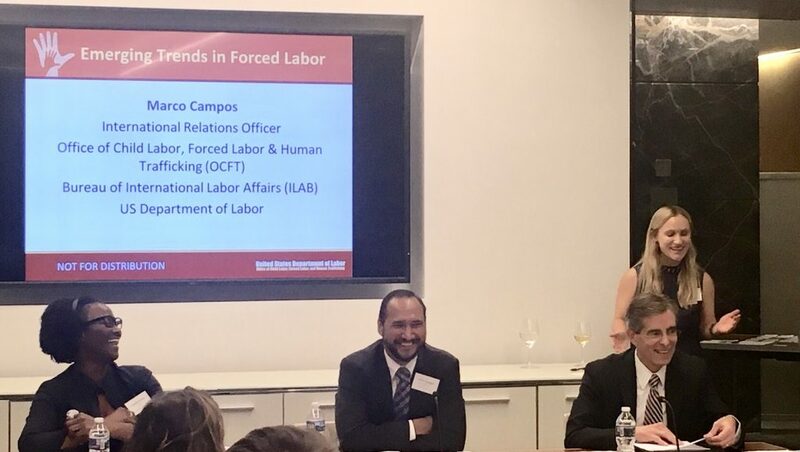 On November 6, CT Strategies’ Co-Founder, Al Gina, moderated a panel on ‘Emerging Issues in Forced Labor’ with a group of Customs Attorneys in downtown DC at the office of Hogan & Lovells. Co-sponsoring the event were the Young Trade Professionals, the International Trade and Investment Law Society, and the Customs Lawyers Association. Panelists consisted of Marco Campos, an International Relations Officers within the Bureau of International Labor Affairs (ILAB) at the US Department of Labor, Erin Klett, the Director of Research and Policy at Verite, and Janelle Gordon, Detailee to the Forced Labor Division at CBP. The discussion covered a wide range of issues within the topic of forced labor from the complexity of enforcement, the difficulty of ensuring a product’s supply chain does not utilize forced labor, to the relationship between private entities and public agencies in how to combat the issue. Panelist Janelle Gordon spoke about developments within CBP, such as the expansion of a Forced Labor Division, which is aimed to find improved solutions on how to mitigate the use of forced labor in supply chains. This relatively new and challenging issue provoked a spirited, intriguing discussion among the audience and panelists. Please contact CT Strategies for additional information on the issue of forced labor in the supply chain. CT Strategies’ Allen Gina Discusses Marijuana Legalization and other Trade Topics with Trade Attorney, Jennifer Diaz.